It’s taken over three years, but Persona 3's excellent big screen adaptation has finally reached its end. Winter of Rebirth continues on directly from the climax of the last film: the revelation that Ryoji is Death. After explaining that the end of the world is less than two months away because of the awakening of Nyx, Ryoji offers his former friends a choice: kill him and lose their memories of the Dark Hour (allowing them to live their last days normally); or continue to suffer, knowing everything they’ve been through is for naught as they have no chance of beating Nyx. He then gives the team a month to decide. Thus, the majority of the film follows the characters as they attempt to reconcile their knowledge of the end of the world and the choice they have been given. Expectedly, all fall into a deep depression. Akihiko trains with reckless abandon to keep his mind off his growing fear. Junpei alternates between lashing out at his friends and thinking about Chidori. Fuuka struggles with the idea of reconnecting with her past friends in the time she has left. Mitsuru is drawn to memories of her dead father and Ken likewise to memories of Shinjiro. Yukari becomes so depressed she stops eating entirely. Makoto finds himself somewhat disconnected from the rest of the group. In the end, he is the only one who has the actual power to kill Ryoji; and the last thing he wants to do is kill his friend—and he’s not sure he wants to forget how the others have changed his life over the course of their adventures. But it’s not from within that he finds his answer, but from without. Elizabeth is an enigmatic character. She has been the secret adviser to Makoto over the course of the story when it comes to his multiple persona-using ability, but little more. In Winter of Rebirth we see her in a new, personal light. As Makoto struggles with what’s going on, she comes to our world to meet him and then demands a tour. We learn that this is her first time in the human world, that her only contact with it before has been with those like Makoto who visit the Velvet Room. Everything interests her and even the dreary, doomed world is exciting and beautiful to her. Their tour serves to do two things: flesh out Elizabeth and her motivations for the rest of the film (and beyond) and help Makoto find his answer. He begins to understand that neither forgetting nor living in despair is the answer. There is only one choice: to win. At the same time, each of the other team members come to the same realization in their own way. But what makes this scene so powerful is the visuals, especially the expert use of light and shadow. All the Persona 3 films are visually dark and filled with hard shadows and deep blacks. These give the films their emotional baseline. If it’s bright and colorful, things are safe. If not, then danger and/or drama are soon to appear. Throughout Winter of Rebirth the real world is gloomy in color with constantly falling snow. But upon the moment of Makoto’s realization, the clouds part and sun shines down for the first time in the film. But while the team at large comes to the decision to let Ryoji live and to face Nyx upon its awakening, one person has been left out of this choice: Aigis. Her arc over the course of the movies has been a mysterious one. An android with a soul, she has been drawn to Makoto without ever knowing why. Of course, with the film’s revelation about Ryoji, she remembers all: how she sealed Death inside a young boy (Makoto) 10 years before. Her very purpose—her reason for existence—has been to kill Ryoji. When the others pass on that goal, she cannot understand their thinking. While humans struggle with the meaning of life, as a robot, she has never had such a problem. But now, knowing that she has failed at bringing about Ryoji’s death in the past and seeing her friends actively oppose what she is trying to do, Aigis reaches a character-defining moment. She chooses a new purpose: to be with Makoto and protect him forever. Yet, while she may have chosen this new goal for herself, Makoto chooses his own path. In the first film, Makoto was so ambivalent about life he was willing to die for any reason. In the second film, his fear of losing his new friends and returning to an isolated life almost led the team to defeat. In the third film, he cut ties with the group to spare himself the pain that would come from the deaths of those close to him. In Winter of Rebirth his character arc reaches its final conclusion. Having come to understand the value and importance of friendship, Makoto is now willing to give up everything to guarantee not only a place for his friends to be happy, but for all people to have that chance. This in turn leads to the film’s bittersweet ending. If this film and the others in the Persona 3 tetralogy have one flaw, it is the large amount of skipped days. As a transition between scenes, we constantly see a calendar that fast forwards to the next important event. While this gives a solid sense of continuity to the films, it also makes you wonder what was missed during that time. When characters have a major fight, we rarely see the morning after, instead fast forwarding to weeks later. And after something vital to the story happens, you certainly worry that you have missed something important or emotionally meaningful each time you watch the calendar fly by. 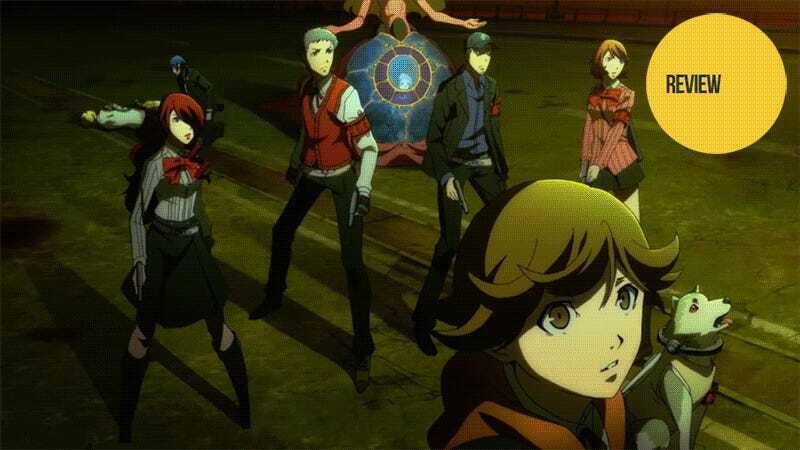 Persona 3 The Movie: Winter of Rebirth is likely not what you would expect as the capstone to a series of films about fighting monsters with magic, weapons, and creatures formed from the very essence of your personality. While the big final action climax is certainly there (and looks great), Winter of Rebirth is really a movie about coming to terms with loss and despair and moving beyond it. Though this film brings the series to a bittersweet end, it is still one full of hope for the future as the adventures of Makoto and his friends have clearly changed each of them for the better. As for the film series as a whole, it is a great adaptation of the game. While many side stories, plot threads, and romances never made it into the films, what does make it into the films is thematically relevant and keeps the series as a whole focused on the main plot. The decision to give Makoto a set personality far stronger than the blank state portrayed in the game is the film’s greatest addition and one that makes the films worth watching for both fans of the game and newcomers alike. If you want to introduce someone to the world of Persona or just want to review it yourself before Persona 5 comes out, the Persona 3 film series is an excellent way to do it. Persona 3 The Movie: Winter of Rebirth was released in Japanese theaters on January 23, 2016.